“Today, I will begin circulating two privileged resolutions which will trigger debate and votes on a timely withdrawal of U.S troops from Afghanistan and Pakistan. “Article I, Section 8 of the Constitution of the United States makes it Congress’ responsibility to determine whether or not we go to war or stay at war. Consistent with Article 1, Section 8, the privileged resolutions will invoke the War Powers Act of 1973. I ask for your support of these resolutions, which will be introduced in the House in January. “Yesterday, with the US Secretary of Defense at his side, the President of Afghanistan declared that his country’s security forces will need financial and training assistance from the United States for the next 15-20 years. “We cannot afford these wars. We cannot afford the loss of lives. We cannot afford the cost to taxpayers. We cannot afford to fail to exercise our constitutional right to end the wars. “Please sign onto the privileged resolutions to end the wars and to bring our troops home. Read a draft copy of Kucinich’s privileged legislation HERE and HERE. 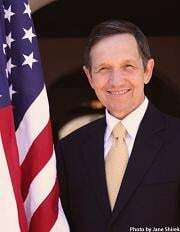 See a copy of the Kucinich’s letter to colleagues HERE.